This one-story home includes 3,756 square feet of living spaces and features four bedrooms, four full baths, study and outdoor living space with a fireplace. The Maidstone has an open-concept floor plan with a centrally-located kitchen that opens to the sunroom, breakfast room and family room. Homes in The Preserve at Thomas Springs are situated on one acre homesites and priced from the $670s and range in size from 3,000 to 4,500 square feet. Homebuyers can choose from eight distinct one- and two-story floor plans and select from thousands of Custom Choices to personalize a home. 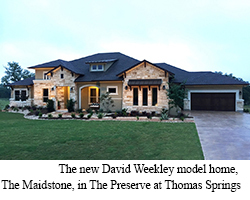 The Maidstone is located at 9828 Fallow Run and is open for tours Monday - Saturday from 10 a.m. - 7 p.m. and Sunday from noon - 7 p.m. For more information about The Preserve at Thomas Springs, call 512-821-8882.